Southern Charm knows no equal as a stroll through one of the 22 beloved squares in the downtown of Savannah. Whether you are in Chippewa Square where the famous Forrest Gump Bench Scene was filmed or following in the footsteps of The Garden of Good and Evil in Monterey Square at the Mercer House, you are inevitably going to get swept up into the beauty of the city. PHOTO: River Street, seen from Hutchinson Island across the Savannah River. Probably second only to the beauty of the squares of Savannah is the fun of River Street. These more-than-100-year-old buildings which were once Cotton Warehouses now house shops, bars and restaurants, all overlooking the beauty of the Savannah River and Hutchinson Island. Savannah being such a busy port (they are the fourth busiest container terminal in the nation), you will quite regularly see a huge container ship cruise down the river. Not only is it a sight to see, but some of the bars even offer discounted shots/beers while the ship is in transit. Savannah Candy Kitchen and River Street Sweets are the “must-do’s” here. The pralines, chocolate covered everything and in house pulled taffy are just the tip of the iceberg. 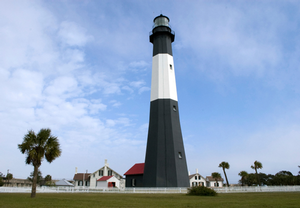 PHOTO: The lighthouse at Tybee Island. River Street is on the water, but you aren’t going swimming in there. Not to worry, the beach is not too far away. Tybee Island is less than 30 minutes from downtown and has five miles of beach for you to enjoy. There are dolphin tours, biking, fishing, sailing, and plenty of places to stay should you want to spend the night. Make sure to get to the Crab Shack, which is pretty much what it sounds like: A fish house with good food and enough ambiance to please everyone. 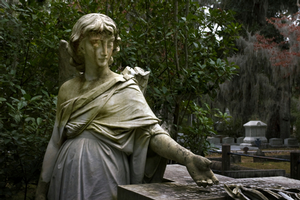 PHOTO: The statues at Bonaventure Cemetery are said to move when you're not looking. To be fair, they're still fairly creepy staying still. 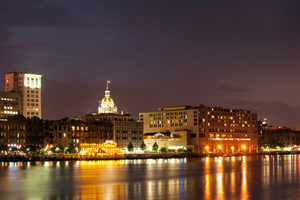 Savannah is consistently rated as one of the most haunted cities in the South. If you have ever been to Savannah for their St. Patrick’s Day festivities, you know these folks can throw down a drink or two. Why not combine the two? Yes, haunted pub tours! There are a ton of places of spirits with haunting spirits. 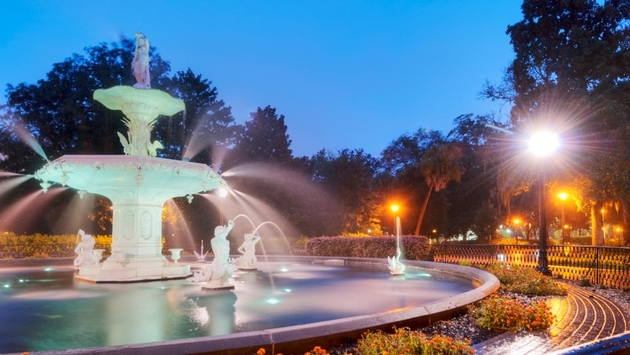 These tours are a great way to enjoy the nightlife of Savannah, hear some great stories about the ghosts of the city and maybe even get a little creeped out to boot. Some of the bars even offer discounts to the folks on the tours (I remember, or barely remember double pours for the price of singles at one place). Keep in mind this is NOT fun for the whole family as these tours are for the Ghost Hunters 21 years old and up. There are multiple companies that offer haunted pub tours. My favorites are Savannah Ghost Tours, Savannah Tours, and Ghost City Tours. While Paula Deen did have her heyday here and still every time I walk by Lady and Sons there are folks in there having a bite, there is much more to the Southern Cuisine of Savannah. If you want the real deal, look no further than Mrs. Wilkes' Dining Room, a family-style sit-down with your friends and strangers and have yourself a hearty (and hardly heart healthy) helping of Southern Cooking. They have been serving up Southern Hospitality since 1943 and the original Mrs. Wilkes strolled that dining room till her death in 2002 at age 95! Some of the other “must-do’s” in Savannah are Leopold’s Ice Cream, the Crystal Beer Parlor, and the Old Pink House. Celebrity Chefs are not lost on Savannah either with James Beard Award Winning Chef Hugh Acheson recently opening his first in the city: The Florence. Find time to get to the city of Savannah and experience some of the finest landscape, cuisine and people that the South has to offer. You won’t regret it. Have a praline for me!